In the final moments of Jiří Kylián's strenuous Return to a Strange Land, Samantha Klanac Campanile made sure her exhaustion didn't stop her from savoring the moment. She looked around The Joyce Theater as the lights began to dim and soaked up her last scheduled appearance there. "I took a mental picture because I thought, I'm never going to do this again," she said. In September of 2016, after over 14 years with Aspen Santa Fe Ballet, Campanile retired. She and her husband moved back to Buffalo, New York, where they both grew up and first dated in high school. She settled into a new life as a fitness instructor and gave birth to daughter Anja in July 2017. Fast forward to late 2018. Back in Aspen, company directors Tom Mossbrucker and Jean-Philippe Malaty learned that one of their current dancers was pregnant and wouldn't be able to perform in the spring. The company has only five men and five women, so losing a dancer creates a challenge. But the directors were in a particular bind: For their March season at the Joyce, they'd programmed two pieces featuring all 10 company members, Nicolo Fonte's Where We Left Off and Fernando Melo's Dream Play. "We usually can have roles covered within the company," Malaty said. "But we took a risk with two full-company pieces and wound up with a problem." Campanile with her daughter Anja. Courtesy Campanile. Malaty mentioned the situation to Campanile, now 35. "J.P. said to me, 'do you know anyone taking class?'" Campanile said. "I thought he was kidding and we had some fun banter. But then he said, 'Would you consider coming back?'" Campanile thought she was in shape for a "normal" person, but she wasn't sure that was enough to be back onstage. She rarely took class anymore and only taught dance as a sub. But the chance to perform again was too good to pass up. In early January, she figured out a plan to get herself ready, and decided to go for it. She had just a little over six weeks to get ready for a one-week rehearsal period, followed by performances in Scottsdale, Arizona, and then the Joyce. She set out on a course of taking class, working out and renting studio space to rehearse both roles off a video. It was challenging to find the time. "The cliché is true: As a mom, you don't have time for anything," Campanile said. "Anja would take a nap and I'd take out the video and go over the choreography, or I'd get up at 5 am to work out." She credits her work as a teacher with The Bloom Method, a fitness method specializing in pre and post-natal conditioning, for her successful comeback. 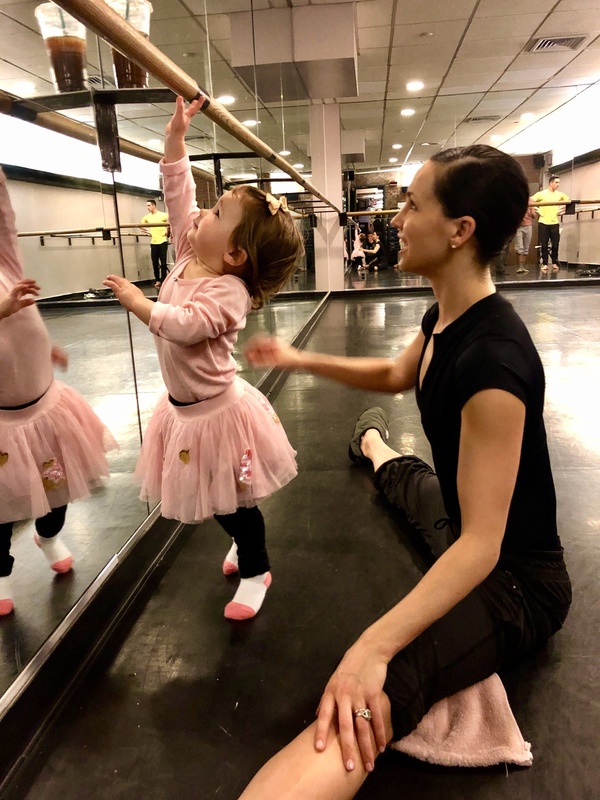 "Dancing with better awareness of my core and functional movement patterns, my body feels much better supported now," she said. "I broke some bad habits." That said, she was nervous when she arrived in Santa Fe for rehearsals. "Would people wonder, why didn't they just hire someone young?" she said. "I was the new person for the first time in a long time." But quickly, she felt support from her colleagues and the company's directors, who were thrilled with her performances. "Having her back was a gift," Malaty said. "Her physical beauty, yes, but her honesty. You see her soul onstage, this time even more than before." 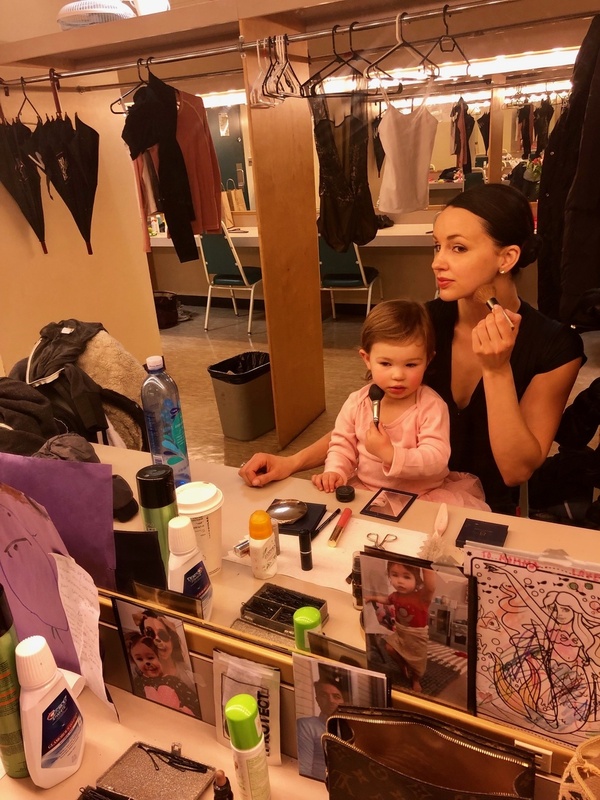 Campanile and her daughter Anja get ready backstage at The Joyce Theater. Courtesy Campanile. During her performances at the Joyce, Campanile stood out for her long line and dramatic intensity. In the middle of Fonte's piece, the lights suddenly dim and she runs over to a male dancer as he exits the stage. In supported, off-balance extensions, she gave the moment urgency, as if trying to stop time and keep the moment from ending and the lights from going out. For all her intensity, Campanile described being back onstage as calming. "Being a mom is 24 hours a day. It's the most selfless thing," she said. "Being onstage, having some time for myself, it's like a mental vacation." She always hoped to become a mother, but with ASFB's heavy touring schedule, she never planned to return to the company after pregnancy. So the sweetest moment of her comeback came when the curtain went up and she saw her daughter Anja in the audience. As she did the last time at the Joyce, Campanile savored the moment. "It was so surreal to see her there," she said. "In my wildest dreams, I never thought this would happen." With the performances over, she's back to Buffalo and the new life she's built, with no more performing on the horizon. "Being a mom is my greatest role now," she said. "But I never expected this to happen, so who knows what's in store?"